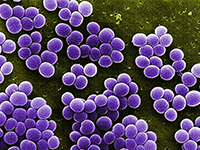 NEW YORK (February 5, 2015) — The microbes that call the New York City subway system home are mostly harmless, but include samples of disease-causing bacteria that are resistant to drugs — and even DNA fragments associated with anthrax and Bubonic plague — according to a citywide microbiome map published today by Weill Cornell Medical College investigators. Infographic showing the relative amount of DNA found in the New York subway system form bacteria associated with the human body. Click to enlarge. The study, published in Cell Systems, demonstrates that it is possible and useful to develop a "pathogen map" — dubbed a "PathoMap" — of a city, with the heavily traveled subway a proxy for New York's population. 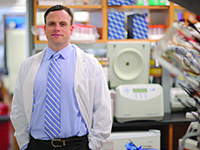 It is a baseline assessment, and repeated sampling could be used for long-term, accurate disease surveillance, bioterrorism threat mitigation, and large scale health management for New York, says the study's senior investigator, Dr. Christopher E. Mason, an assistant professor in Weill Cornell's Department of Physiology and Biophysics and in the HRH Prince Alwaleed Bin Talal Bin Abdulaziz Al-Saud Institute for Computational Biomedicine (ICB). The PathoMap findings are generally reassuring, indicating no need to avoid the subway system or use protective gloves, Dr. Mason says. The majority of the 637 known bacterial, viral, fungal and animal species he and his co-authors detected were non-pathogenic and represent normal bacteria present on human skin and human body. Culture experiments revealed that all subway sites tested possess live bacteria. Strikingly, about half of the sequences of DNA they collected could not be identified — they did not match any organism known to the National Center for Biotechnology Information or the Centers for Disease Control and Prevention. These represent organisms that New Yorkers touch every day, but were uncharacterized and undiscovered until this study. The findings underscore the vast potential for scientific exploration that is still largely untapped and yet right under scientists' fingertips. "Our data show evidence that most bacteria in these densely populated, highly trafficked transit areas are neutral to human health, and much of it is commonly found on the skin or in the gastrointestinal tract," Dr. Mason says. "These bacteria may even be helpful, since they can out-compete any dangerous bacteria." But the researchers also say that 12 percent of the bacteria species they sampled showed some association with disease. For example, live, antibiotic-resistant bacteria were present in 27 percent of the samples they collected. And they detected two samples with DNA fragments of Bacillus anthracis (anthrax), and three samples with a plasmid associated with Yersinia pestis (Bubonic plague) — both at very low levels. Notably, the presence of these DNA fragments do not indicate that they are alive, and culture experiments showed no evidence of them being alive. Yet these apparently virulent organisms are not linked to widespread sickness or disease, Dr. Mason says. "They are instead likely just the co-habitants of any shared urban infrastructure and city, but wider testing is needed to confirm this." For example, there has not been a single reported case of the plague in New York City since the PathoMap project began in June 2013. "Despite finding traces of pathogenic microbes, their presence isn't substantial enough to pose a threat to human health," Dr. Mason says. "The presence of these microbes and the lack of reported medical cases is truly a testament to our body's immune system, and our innate ability to continuously adapt to our environment. "PathoMap also establishes the first baseline data for an entire city, revealing that low-levels of pathogens are typical of this environment," he adds. "While this is expected in rural environments, we've never seen these levels before in cities. We can now monitor for changes and potential threats to this balanced microbial ecosystem." Scientists now believe that the diversity of microorganisms that are present in, on and around humans comprise a significant component of overall health. In the average human, there are 10 times as many microbes as human cells, and products processed by these microbes comprise more than one-third of the active, small molecules in the bloodstream. This collective microbiome is seen to impact health by exacerbating or resisting infectious diseases, controlling obesity risk, and regulating metabolic rates. Yet there is very little known about the native microbial communities that surround people in streets, buildings or public transit areas. In the study, the research team — which includes investigators from five other New York City medical centers and others from around the country and internationally — sought to define the microbiome in New York City's subway system, which in 2013 was used by an average of 5.5 million people per day, according to the city's Metropolitan Transportation Authority. Over the past 17 months, the team — many of them student volunteers, medical students and graduate students — used nylon swabs to collect, in triplicate, DNA from turnstiles, wooden and metal benches, stairway hand railings, trashcans, and kiosks in all open subway stations in 24 subway lines in five boroughs. The team also collected samples from the inside of trains, including seats, doors, poles and handrails. Investigators are currently analyzing additional samples collected during all four seasons to study the temporal dynamics of the microbiome. The sample collectors were equipped with a mobile app built by the researchers, which allowed them to time stamp each of the samples, tag it using a global positioning system and log the data in real time. DNA from the microbes was sequenced using the most advanced research technology at the Weill Cornell Epigenomics Facility and the HudsonAlpha Institute for Biotechnology. They sequenced 1,457 samples out of more than 4,200 collected, and the results were analyzed in the ICB. "We had our hypothesis about what's on the surfaces of the subway, which reflects a massive, diverse, busy metropolis, but we really had no idea what we would find," says co-lead author Ebrahim Afshinnekoo, a senior at Macaulay Honors College -Queens who starting working on the project as a Tri-Institutional Computational Biology and Medicine Summer Student in 2013. The majority of the DNA from all the samples, 48.3 percent, did not match any known organism, "which underscores the vast wealth of unknown species that are ubiquitous in urban areas," Afshinnekoo says. The most commonly found organism (46.9 percent) was bacteria. Despite some riders' fears of catching cold or flu from fellow straphangers, viruses were rare — they made up .032 percent of the samples. However, some seasonal viruses are RNA viruses, not DNA viruses, and they would not be identified with the collection methods used in the study. Of the known bacteria, the majority (57 percent) found on the surfaces of the subway have never been associated with human disease, whereas about 31 percent represented opportunistic bacteria that might pose health risks for immune-compromised, injured or disease-susceptible populations, researchers report. The remaining 12 percent have some evidence of pathogenicity. They found that dozens of microbial species were unique to each area of the train, and that there is a significant range of microbial diversity across different subway lines. The Bronx was found to be the most diverse with the most number of species found, followed by Brooklyn, Manhattan and Queens. Staten Island was the least diverse. "We built maps that detail what organisms are present in each area of the city, creating a molecular portrait of the metropolis," says co-lead author Dr. Cem Meydan, a postdoctoral associate at Weill Cornell Medical College. Despite sampling surfaces of areas of high human traffic and contact, the researchers found that only an average of 0.2 percent of reads uniquely mapped to the human genome. Using tools like AncestryMapper and ADMIXTURE, the investigators took human alleles and recreated census data of a particular subway station or neighborhood. Their results showed that the trace levels of human DNA left of the surface of the subway can recapitulate the U.S. Census data. For example, a Hispanic area near Chinatown in Manhattan appeared to hold a strong mixture of Asian and Hispanic human genes. An area of North Harlem showed African and Hispanic genes, and an area of Brooklyn with a predominantly white population was predicted to be Finnish, British and Tuscan. "This provides a forensic ability to learn about the ancestry of the people who transit a station," Dr. Mason says, "and it means the DNA people leave behind can reveal a clue as to the area's demographics." The researchers also compared their microbial data with U.S. census data, as well as average ridership data from the MTA. They found a slightly positive correlation between these two variables and the population density of microbes on the subway, suggesting that the more people in an area, the more diverse the types of bacteria. Efforts like PathoMap in New York can readily be applied to other cities to provide a new tool for disease and threat surveillance, Dr. Mason says. "With the further development of sequencing technologies, I believe having a live model tracking the levels of potential pathogens could be possible," he says. "I envision PathoMap to be the first step in that model." Projects are already underway that build upon PathoMap's initial data and further the researchers' goal of investigating the microbiome of large, complex cities. Collaborators across the country have collected samples from airports, subways, transit hubs, taxis and public parks located in 14 states — including New Jersey, Massachusetts, Maryland, Florida, Illinois, Texas and California. By sequencing the DNA of these samples, Dr. Mason hopes to create the first ever comparison of major cities in the nation that contextualizes urban and rural, high density and low density environments. The researchers also worked with the MTA to gain access to the South Ferry station that was completed submerged by Superstorm Sandy in 2012, and which was still closed during sampling. (The station reopened in April 2013.) Dr. Mason's team sampled the walls and floors of the station, and found 10 species of bacteria present that were found nowhere else in the system. Notably, all of the species are normally found in marine or aquatic environments. "The walls of the subway still carry the echo of the hurricane, and you can see it in the microbiome," Dr. Mason noted. "The big questions are — how long will it stay? How does this impact health and the design of the built environment of the subway? This is why we have kept sampling and swabbing since we started. The temporal dynamics are key." The study was supported by the National Institutes of Health (F31GM111053), the Weill Cornell Clinical and Translational Science Center, the Pinkerton Foundation, the Vallee Foundation, the WorldQuant Foundation, the Epigenomics Core Facility at Weill Cornell, the HudsonAlpha Institute for Biotechnology, Illumina, Qiagen, and Indiegogo (for crowdfunding and crowdsourcing support). Study co-authors include, from Weill Cornell Medical College, Shanin Chowdhury, Cem Meydan, Dyala Jaroudi, Collin Boyer, Nick Bernstein, Darryl Reeves, Jorge Gandara, Sagar Chhangawala, Sofia Ahsanuddin, Nell Kirchberger, Isaac Garcia, David Gandara, Amber Simmons, Yogesh Saletore, Noah Alexander, Priyanka Vijay, Elizabeth M. Hénaff, Paul Zumbo; Timothy Nessel, Bharathi Sundaresh, and Elizabeth Pereira from Cornell University; Sergios-Orestis Kolokotronis from Fordham University; Sean Dhanraj, Tanzina Nawrin, Theodore Muth, Elizabeth Alter and Gregory O'Mullan from City University of New York; Ellen Jorgensen from Genspace Community Laboratory; Julia Maritz, Katie Schneider, and Jane Carlton from New York University; Michael Walsh from the State University of New York, Downstate; Scott Tighe from the University of Vermont; Joel T. Dudley and Eric E. Schadt from the Icahn School of Medicine at Mount Sinai; Anya Dunaif and Jeanne Garbarino from Rockefeller University; Sean Ennis, Eoghan Ohalloran and Tiago R Magalhaes from the University of Ireland; Braden Boone, Angela L. Jones, and Shawn Levy from HudsonAlpha Institute for Biotechnology; and Robert J. Prill from the IBM Almaden Research Center. Weill Cornell Medical College, Cornell University's medical school located in New York City, is committed to excellence in research, teaching, patient care and the advancement of the art and science of medicine, locally, nationally and globally. Physicians and scientists of Weill Cornell Medical College are engaged in cutting-edge research from bench to bedside aimed at unlocking mysteries of the human body in health and sickness and toward developing new treatments and prevention strategies. In its commitment to global health and education, Weill Cornell has a strong presence in places such as Qatar, Tanzania, Haiti, Brazil, Austria and Turkey. Through the historic Weill Cornell Medical College in Qatar, Cornell University is the first in the U.S. to offer a M.D. degree overseas. Weill Cornell is the birthplace of many medical advances — including the development of the Pap test for cervical cancer, the synthesis of penicillin, the first successful embryo-biopsy pregnancy and birth in the U.S., the first clinical trial of gene therapy for Parkinson's disease, and most recently, the world's first successful use of deep brain stimulation to treat a minimally conscious brain-injured patient. Weill Cornell Medical College is affiliated with NewYork-Presbyterian Hospital, where its faculty provides comprehensive patient care at NewYork-Presbyterian Hospital/Weill Cornell Medical Center. The Medical College is also affiliated with Houston Methodist. For more information, visit weill.cornell.edu.